We drive past this shop in Salem all the time. The gates are always pulled down and the sign is flipped to closed. Yesterday afternoon we again passed Greg took a look and declared the store was open! The car was running on empty but we had no choice but to stop. In the car we tried to come up an excuse to go in beyond our natural curiosity of what sort of treasures would fill a store called, Fix Master. I was in a sneaky mood so I sent Greg in first to distract the shop keeper so I could take some photos. 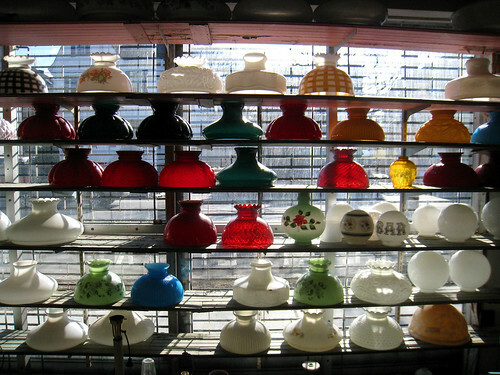 The store was full of old dusty shelves with ceramic and glass lamp shades neatly lining them. 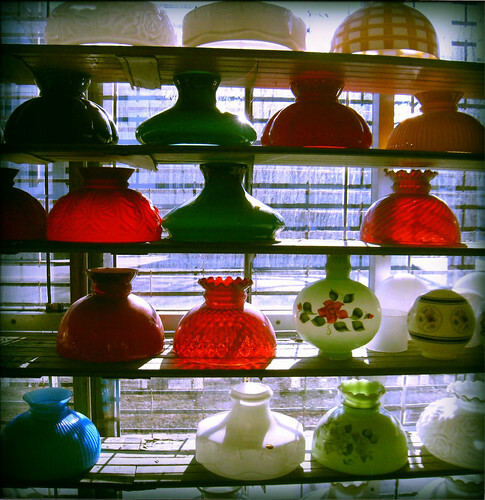 The colors glowed on the long open shelves as the light shined through the open space and dust. Greg had a quick chat with fix master he explained we had a broken furnace but all it needed was this one part. The fix master didn’t bite. Told Greg he doesn’t do that type of work, too time consuming. Hmmm what else do we have for this master to fix? The shop was pretty cool. I'm sure he could fix your blender. Bring it on up Liz. I broke our blender and have no idea where to go to have it fixed. 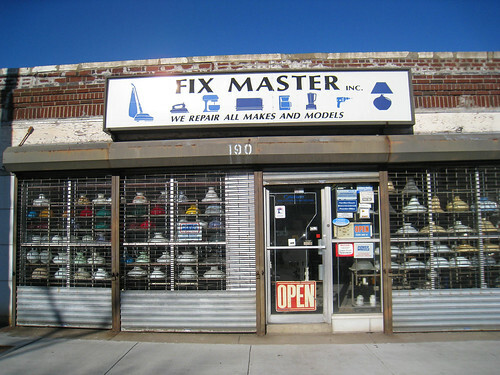 It seems like such an outdated concept – but I could use a Fix Master around here! this is hilarious. and beautiful.